Yep, last book haul of the year - last vlog of the year, actually. It's definitely been a great, book-filled year, just the way I you we like love it! (5:24) and an owl notebook from Renee (http://www.youtube.com/user/NEHOMAS2)! 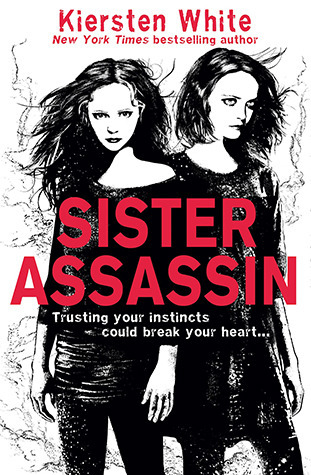 Here is the US version of KWhite's next book, and the UK version, which beyond having a totally different cover - and feel to that cover - also has a completely different name (Sister Assassin). These two give very different impressions, so I'm definitely curious which you'd reach for. 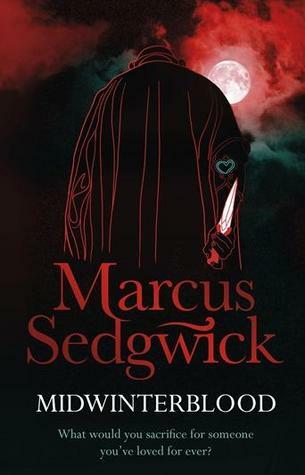 Last Week Um, sorta 2 weeks ago on FFO: We had a non-traditional Face Off when the US and UK trailers for Marcus Sedgwick's Midwinterblood went head to head. Each trailer had a very distinct vibe and highlighted completely different aspects of the book, which was pretty interesting, but in the end, the UK's more ominous tone won out. Some of these were big wishlisters, and some were pure impulse buys, but I have to say, they all make me happy-faced. All of these came from BETTERWORLDBOOKS.COM, which I love. I know I sound like a paid advertisement for them, but I swear that's just my serious bookseller love coming through - they're a for-profit business with a soul, and I've been pushing them on everyone for years, so I love when someone new discovers them. But though I'm too scattered and in frenzied present-making mode to organize my thoughts for a review or five, I do have a backlog of videos to get out, and I figured I'd start with a seasonally appropriate one: the Literary Festive Tag. This was created by Renee, whose original tag you can see here. It's pretty straight-forward; questions are below. Feel free to leave your answers to any of the questions in the comments! 4. Which literary character do you think would give the best gifts? 5. If you could chose 3 literary characters to bestow gifts upon, who would they be, what would you give them, and why. 6. If you could give one character a lump of coal for being bad, who would it be? 7. Which Scrooge-like character do you think would be the biggest downer during the holiday season? 8. Invite 5 authors and 5 characters to a festive season party! To watch the super quick version, go here. 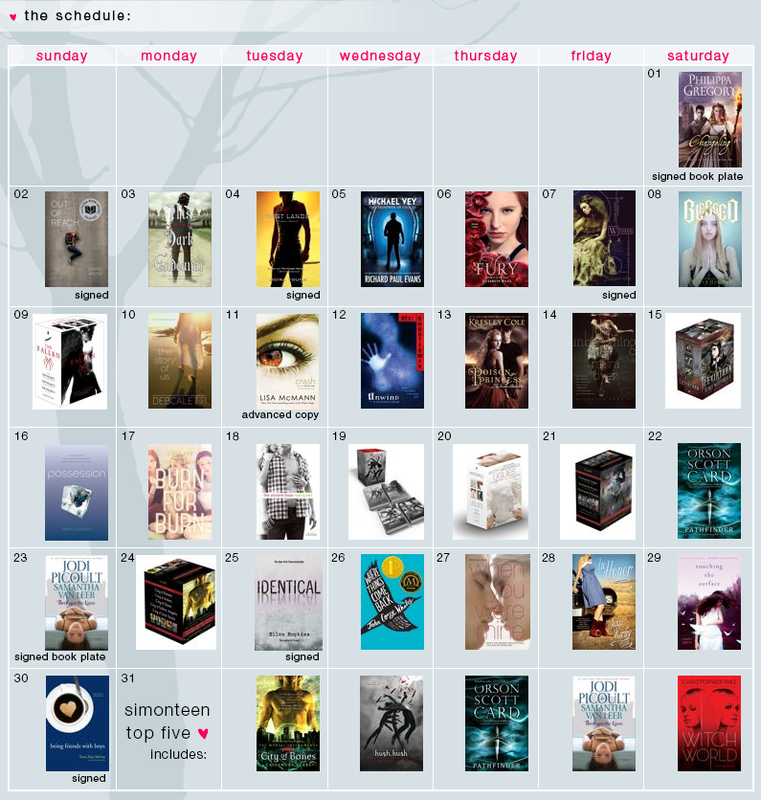 Catch up on the rest of the bookshelf tour so far here. Welcome to the last Book Chat of the year!! So, since I know everyone's busy with end of the year stuff, and you're probably thinking about or doing this already anyway, I figured we'd go with our best books of 2012 for this month's topic. You can decide how many you want to showcase in YOUR Best Of, but I'm going with my top 12(ish) of 2012. Today I have a guest post from Rachel Roberts, author of the middle grade magical adventure series, Avalon: Web of Magic. The series (and the resulting manga) have some of the most gorgeous artwork in kids books right now (seriously, so pretty! ), but today Rachel is going to talk a bit about her biggest tips for writers - so all of you who just tried desperately to NaNoWriMo and struggled, take note! Greetings mages! Here are some tips to get you writing your own story. Just start writing: Sometimes it feels scary to look at a blank screen or piece of paper. You want everything to be perfect, but the most important thing is to get your ideas and feelings onto the page, no matter what they look like on the first try. The goal is to create the building blocks of your story, one step at a time. You have an outline with chapters, so expand on those, filling them out with descriptions and dialogue. Start with one chapter at a time, and soon you'll have a first draft! As you go, try printing each chapter and scribbling notes all over it with a good red pen. You'll end up crossing out what you don't need, rearranging some things and coming up with new ideas. Once you input these notes back into your document, you've got a second draft that is looking more polished and one step closer to being done. Repeat the print-scribble-input process until you're satisfied that you have your final draft. Remember, working on a story is half writing and half editing - even this blog went through several drafts! - so just write, knowing that you're building your story piece by piece and will smooth out the rough edges with each draft. Research: Nothing takes a reader out of a story faster than feeling like the writer doesn't know what they're talking about. So if you decide that your character is going to ride a train, but you, the author, have never ridden a train, you don't know how a train feels and smells and sounds, so your description is not going to be authentic. Go to the library, research on line, talk to someone who has experienced what you're writing about, or, if possible, get on that train yourself. Research is especially important when writing fantasy. That might sound weird - how are you supposed to research things you're making up? But fantasy is where research meets imagination. You need good, solid details to make your creatures and magical places feel authentic, no matter how fantastical they are. Creating a magical creature like a mistwolf definitely takes imagination, but without researching how wolves look, move, hunt, and communicate, Stormbringer, Dreamer and the rest of the pack wouldn't have the details that make them feel like real creatures. How do you make your story unique? Stay true to what you love. When you write from the heart, your descriptions and characters feel authentic, and your story will reflect your unique point of view. Whatever fascinates you - whether it's magic jewels or three toed sloths or spaceships - your excitement will shine through your writing and get readers interested and excited, too. Trust your instincts. If you think something's funny, odds are that your readers will laugh also. It's all in the details: Small details make a big difference. Know the details about your character and your settings, from what kind of stuffed animals are on your heroine's bed to what kinds of trees are growing in your magical forest. You don't need pages and pages of description, just a few key details to make the people and places in your story feel real. Your story will also have certain rules, from how a portal works to the layout of your main character's house. Once you establish these rules, you've got to be consistent. If your unicorn is blue in one scene and green in another, that's going to confuse your readers and take them out of the story. Try keeping a list of important details and drawing maps of your locations so you'll always know what your world looks like and what rules you've got to follow. Choosing the perfect word: The perfect word can turn an okay description into a wow-I-feel-like-I'm-actually-there description. It's also important not to repeat yourself and use the same words over and over. Writing Avalon, it's challenging to come up with different ways to say twinkly - there's so much magic flying around, and well, it's twinkly. If you get stuck, grab a thesaurus and start searching. And if you still can't find the perfect word, don't let that stop you in your tracks. Use a placeholder - whatever fits best at the moment - and you'll try again on the next draft. As with any creative project, writing takes time, work, and discipline. Stories don't just pop onto the page looking perfect, and I hope these blogs have given you some tools to get from your first idea to your final draft. And remember, as you go through each step of the writing process, have fun! 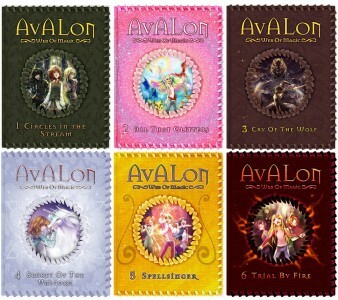 Find Rachel online, and find out more about the Avalon: Web of Magic series here! And make sure to keep an eye out for the pretty amazeballs giveaway I'm going to have coming up! Today I have the pleasure of welcoming Sarah Beth Durst, author of one of my favorite novels of this year (easily), Vessel! 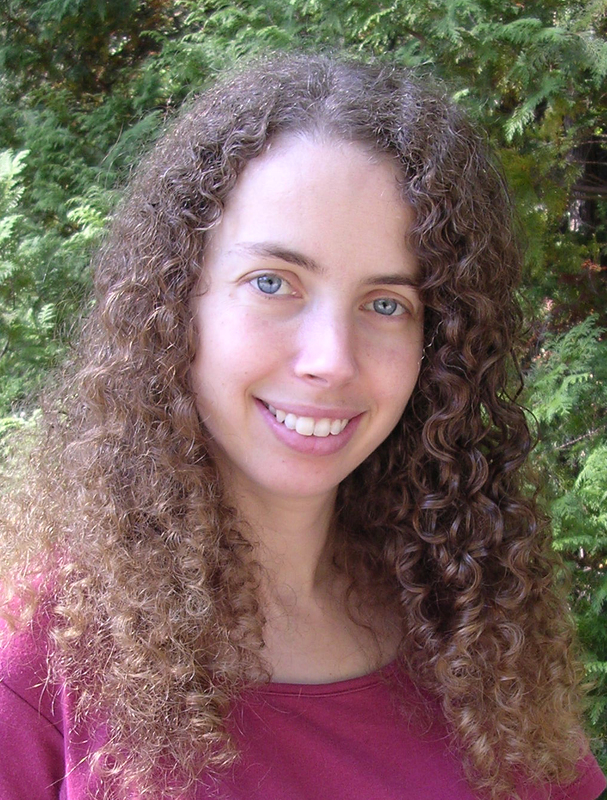 I'll be sharing my thoughts on Vessel tomorrow (they amount to GetItGetItGetItNOW), but until then, Sarah Beth is here to chat with us about building the gorgeous desert world, staying true to yourself as a writer, and what we can expect from her next! Welcome, Sarah Beth! The world of Vessel is incredibly complex and full - did you do a lot of research into desert culture, mythology, history, religion, etc., or did the world evolve organically out of what was needed for the characters and story? I love research! Before I had any idea what the story was or who the characters were, I knew I wanted to write about a desert. So I researched the Gobi, the Sahara, and various other deserts around the world. I like to build my fantasy on a foundation of truth. The most difficult was also the most wonderful: worldbuilding. Writing VESSEL was such an immersive experience. Every time I sat down at my computer, I felt like I was stepping through a portal. And I wanted to be sure that what was on the other side of that portal felt rich and real so I spent a lot of time crafting details, creating the mythology, and imagining Liyana's harsh desert home. Vessel is made up of various nomadic desert clans - which clan would you most like to be a part of, and which clan would you least like to be a part of? I'd love to be a part of Liyana's clan. Her family truly loves one another... even if they did leave her behind to die. Moving on! Each of your books has been completely different from one another - is this intentional on your part? Do you actively seek to try something different each time, or do you just go with whatever grabs you at the moment? All of my books are fantasy, but I do leap around the subgenres. INTO THE WILD and OUT OF THE WILD are fractured fairy tales (about fairy-tale characters in the real world... but the fairy tale wants them back), ICE is a modern retelling of East of the Sun and West of the Moon wrapped up in an Arctic adventure story, ENCHANTED IVY is about getting into college (with talking gargoyles and were-tigers), DRINK SLAY LOVE is my snarky paranormal about a vampire girl who's stabbed through the heart by a were-unicorn, and now there's VESSEL, a sweeping epic adventure about a girl who is destined to sacrifice herself so her goddess can inhabit her body, but her goddess doesn't come. I try to write books that I want to read. Have you ever heard the cliched advice "write what you know"? I firmly believe that advice should be changed to "write what you love." Follow-up: do you ever run into problems because of that, either from publishers or from readers who like to be able to pin people down, and want "another book like ________"? Short answer is: no, it's never been a problem. Longer answer is: as different as my books are on the surface, they’re all me on the inside. So they all have certain things in common. All of them are fantasy. All of them are adventures. All of them have a sense of humor (though the amount varies). All of them have romance (again, the amount varies). And all of them have an overriding feeling of optimism and empowerment. I think fantasy is (or can be) a literature of hope and empowerment. When I close a really good fantasy book, I feel like the world is a little more magical, a little more wonderful, and a little larger than it was before. And I think that feeling can happen regardless of whether the magic comes from vampires, desert deities, or talking gargoyles. One of the things I absolutely love is that for both Drink, Slay, Love and Vessel, before the full synopsis was released, a little teaser synopsis for each was posted. Both were very short and very catchy - do you have any say in these teaser synopses, or even in using them to lead up to the full synopsis. Thanks! Some of them I wrote, some my agent did, some my editor, and some the marketing department at the publisher. With the exception of Into the Wild/Out of the Wild, all of your books have been stand-alones. 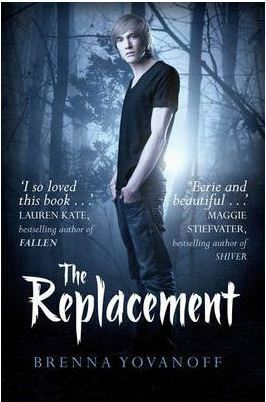 Do you ever want to revisit any of your other books and write a sequel or a spin-off? 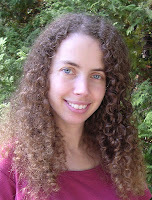 I am actually in the process of writing my very first trilogy, called THE LOST, THE MISSING, and THE FOUND. It's about a woman who runs from her empty life and is trapped in a town full of only lost things and lost people. 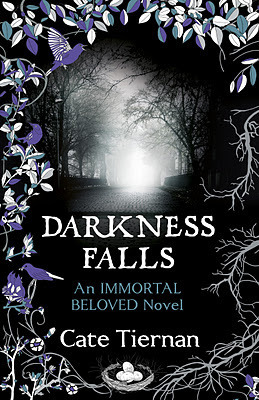 And another follow up, similar to the first - do you ever feel a push from publishers/readers to go the series route? I love when readers want more! That means I did something right. What should we be expecting from you next? Next year, I have two books coming out: THE LOST (the first in the trilogy that I mentioned above) from Harlequin/Luna and SWEET NOTHINGS (title may change) from Bloomsbury/Walker. 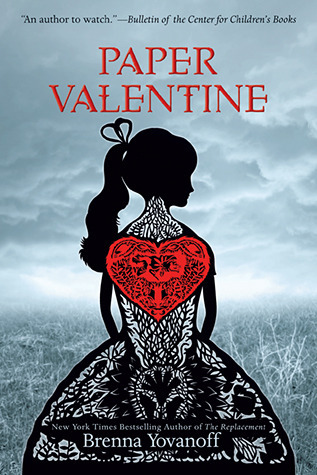 SWEET NOTHINGS is about a girl in the paranormal witness protection program who, haunted by dreams of carnival tents and tarot cards, must remember her past and why she has strange abilities before a magic-wielding serial killer hunts her down. I'm really excited about both of them! Thanks for stopping by! And ooh, I think everyone here knows about my obsession with anything remotely circus-related, right? Carnival tents? Tarot cards? SWEET NOTHINGS is definitely going straight on the wishlist!! Make sure to stop back by for my review of Vessel tomorrow, and leave Sarah Beth some love in the comments! And if you haven't picked up Vessel yet, seriously, do. Yet another book haul. You know how I do. Better World Books haul to come! * Yes, I know this is late. Why didn't someone tell me it was Friday? This week's Face Off is a bit of a nod back to the beginning, when sometimes the books were stock photos and sometimes they were US/UK/etc versions, but most of the time, they were just really similar in some other way - some trend designers just can't seem to give up. This one nose no bounds - get it? Nose! 'Cause there is no...nevermind. 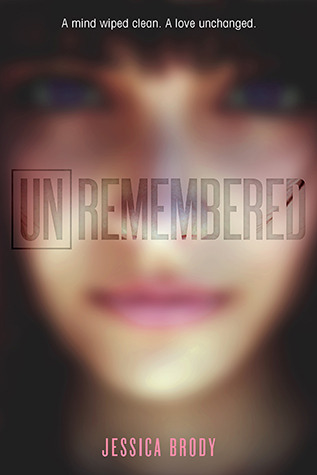 Basically, an extreme close-up of a pretty face, with words right in the middle of it is a pretty popular cover design. One that gets mixed reactions, to say the least. Personally, I like these two covers. But I know many of you will not. 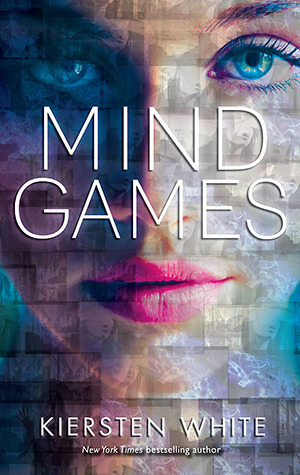 Up for chitty-chat this week: Kiersten White's upcoming Mind Games (remember this one; you'll be seeing it again soon...) and Jessica Brody's Unremembered. Both take a pretty girls face, obscure it, and then cover over the dreaded nose with wordage. So which of these would catch your eye on the shelves? Which would you reach for (or would they both drive you nuts)? What is that, you say? Oh, that's just A GIVEAWAY EVERY DAY IN DECEMBER. Yeah. Enter here, and good luck! This is the Rainbow Spines tag! Y'all, why is it so hard to write reviews about the ones you love? So, fine. We'll take it slow. 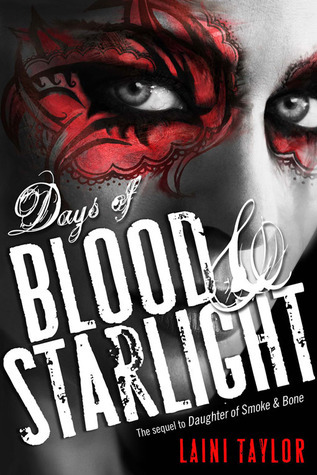 Days of Blood & Starlight is maybe less lyrical and beautiful than Daughter of Smoke & Bone, but somehow better because of it. This isn't to say that Days of Blood & Starlight isn't still beautifully written and compelling, because I doubt anything Taylor writes wouldn't be. But there was a tendency towards being overwrought in book 1 that sometimes seemed to shove the beauty of the writing in your face. It was obviously lovingly crafted, but sometimes showy as a result. But in Days of Blood & Starlight, with this much darker aspect of war and genocide at the fore, rather than just star-crossed love, the floweriness just wouldn't have worked as well, and Taylor seemed to understand this. 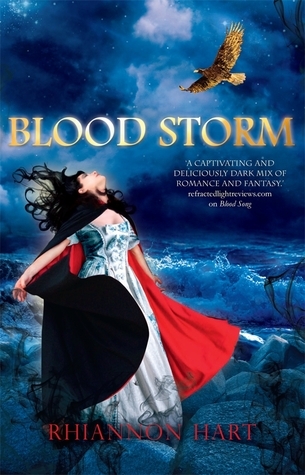 The story is still beautifully crafted and the writing excellent, but Taylor shows more restraint. She turns her talents to garnering more chills than butterflies; she went in with a knife instead of a quill. It would be easy to get caught up in the star-crossed romance in a story like this; it would be too easy to swoon and sigh. Many authors would have been okay with just that, but Taylor knows better. Karou and Akiva may have lost something powerful and beautiful, but they are not the only ones who have lost. In a war, in a genocide, in a mad power struggle, everyone loses. Everyone has lost. Taylor doesn't just woe-is-me all over the place for the fleeting lost epic love that was Madrigal-and-Akiva; she uses their story as a toehold onto the unscalable mountain that is Power and Lust and Hate and Retaliation (and Love. And Hope. And a million other things deserving of capital letters). 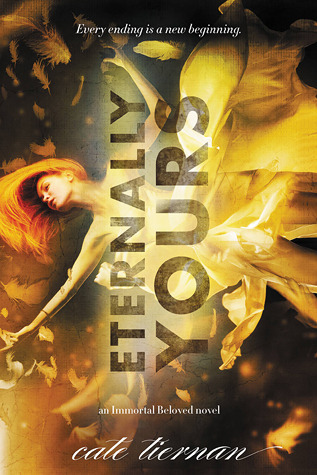 Akiva and Karou are forced to think beyond themselves, to see ramifications and understand the path they walk. It would be easy to give up hope, as Akiva once did; to let themselves be swept up into something "greater" than they, something that takes away the burden of choice. And I think that's the most beautiful thing about this book, and about Akiva and Karou's story - they could choose to not choose; they could throw themselves into vengeance and retaliation and the Greater Goal. But they always choose choice. They always choose the harder path, the one that means you will do the right thing, but will suffer doing so; the one that means you may lose everything so that others can gain the chance - just a chance - at something more. 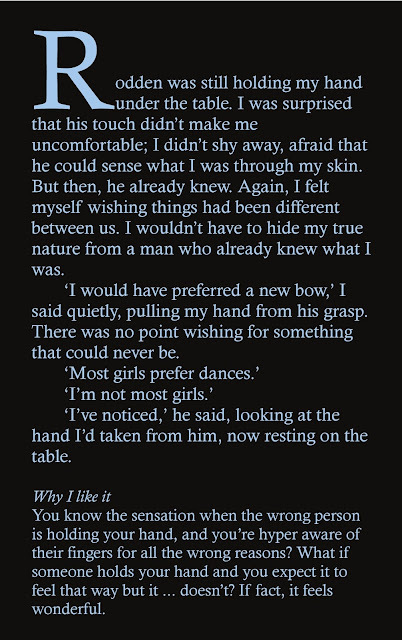 This, I think, is the reason that theirs is one of the few "epic love stories" that doesn't make me roll my eyes. Theirs has always been a story of choice, and of difficult choice at that; theirs has always been a story of sacrifice and selfishness combined, and there's something painfully honest in that. 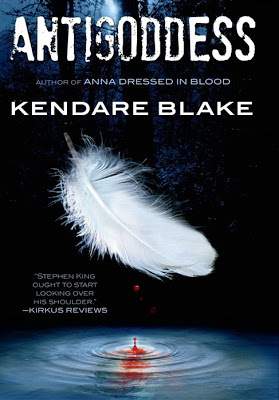 I think by now, you all know I love Kendare (Effen) Blake. Lots. This has been established. So I'm all sorts of grabby hands about her upcoming book, ANTIGODDESS, which now has a cover, meaning it's one step closer to being in said grabby hands. The cover for ANTIGODDESS went through a few versions. That was to be expected. Anna Dressed in Blood went through a few also. What wasn't expected, was the similarity between the two. Let me explain. 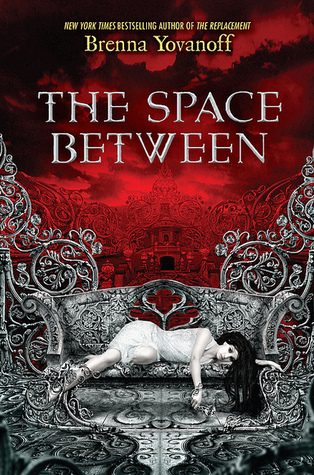 When Anna's cover was first shown to me, it was just the base image. Anna, standing with her bloody dress, in front of her house. There was none of the fencing around my name, or much fog surrounding her legs. Just her. With blood. Dripping from her dress, down her legs. The insides of her legs. You see where I'm going here. Lady problems. Oh, you didn't see where I was going there? Then I apologize for the sudden menstruation reference. So, when it was obvious that ANTIGODDESS wouldn't feature any of the characters on the cover, I felt pretty confident that there wouldn't be any "lady problem" issues. And then the first version came through, with a bloody feather. 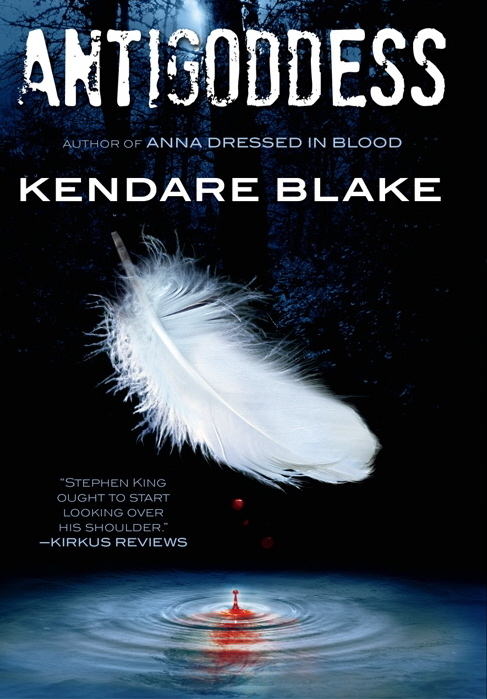 More specifically, a pristine white feather with a fat drop of blood right in the center. And my editor said, "Pretty sure we're going to get rid of the giant feather maxipad, but other than that, what do you think?" Honestly, it felt like a nice way to tie the two books together. And thus begins the long wait until September. It's that time again, AND it's the last time we'll be doing this this year! TBR/Rewind time! First up, my mess of a December TBR. I really wanted to be able to say, Eff it all, I'ma read whatever I want! but I do have a couple of books I really need to read, so instead I have a bit of a hodge podge. Um... So Friday Face-Off time, yeah? 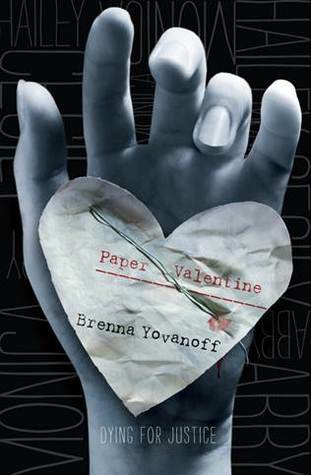 This week we're taking a look at Brenna Yovanoff's Paper Valentine (which needs to be in my hand like NOW). Below are the US and UK versions of the upcoming book, with two very different covers. 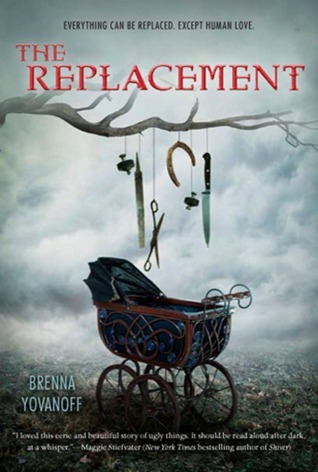 What I find particularly interesting is that in the US, Brenna's books (all stand-alones) have a sort of cover theme going, while the UK books are each their own thing (shown below the FO). But though I may find it interesting, and like the idea of a "set" even though they're not part of a series, this week's Face Off isn't about them, it's about Paper Valentine - so which do you like? Which would you reach for, which would make you curious, and which would you rather have on your shelves? 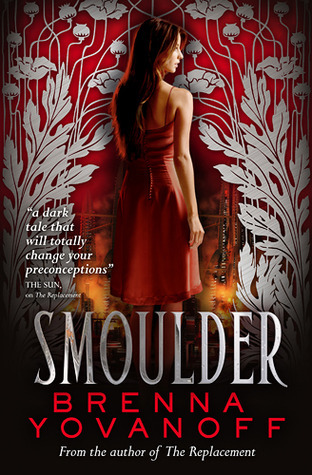 and the UK versions (below), where TSB is called Smoulder. 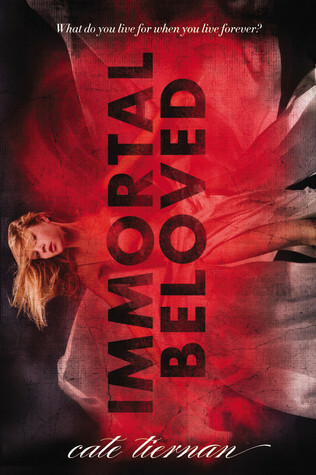 Last Week on FFO: US and UK versions of Cate Tiernan's Immortal Beloved series went head to head, and though we were all pretty decided on the new UK style being boring and generic as hell, we were tied on the originals vs the new US. So in this fantastic series, it doesn't matter what it looks like - just pick it up! 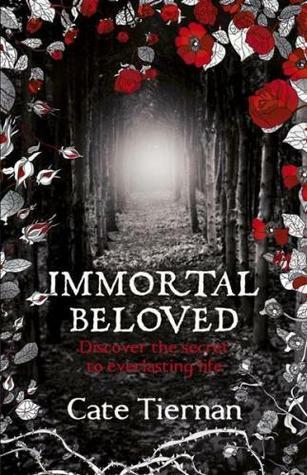 I'm pretty sure I've talked before about how Cate Tiernan's Immortal Beloved series underwent an overhaul between the first and second books (going from this to what you see below); and I know in my rare gushing review* for the first book, also titled Immortal Beloved, I showed some of the other covers from around the world, including the UK edition, which is also below. But it wasn't until I finished the 3rd book a couple of days ago that I actually went through and really looked at the different editions and realized that they needed to be a Face Off. 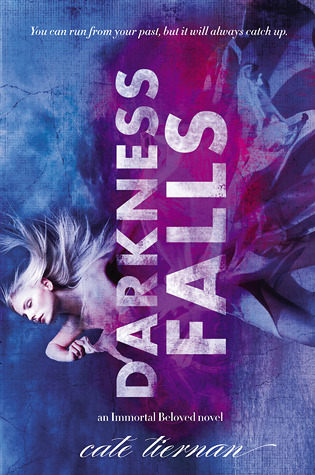 *The second book, Darkness Falls, also got a glowing review. The third will, too. original UK editions + new style? Last Week on FFO: The hardcover and paperback editions of Katherine Longshore's Gilt went head to head, with the steamy revamped paperback just barely snagging a win.